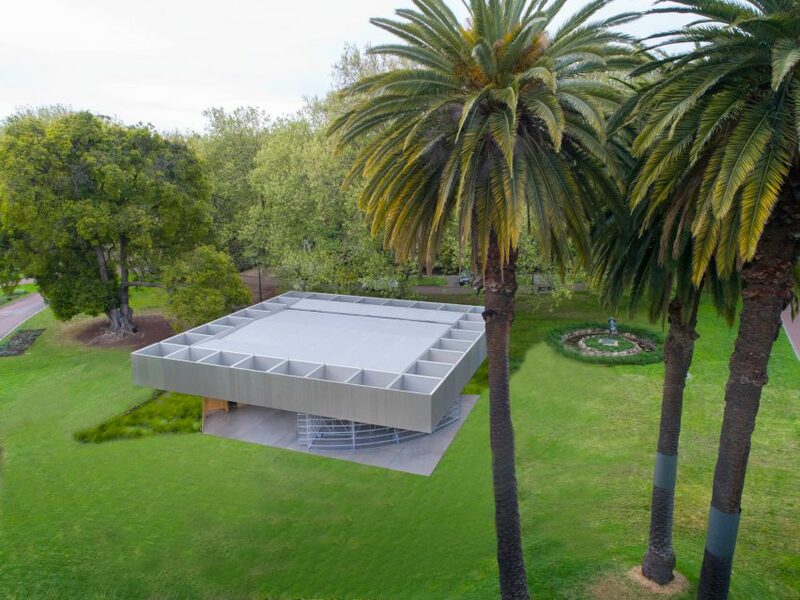 OMA founder Rem Koolhaas and his colleague David Gianotten based their design for the MPavilion – the firm’s first major project in Australia – on the design of ancient amphitheatres. 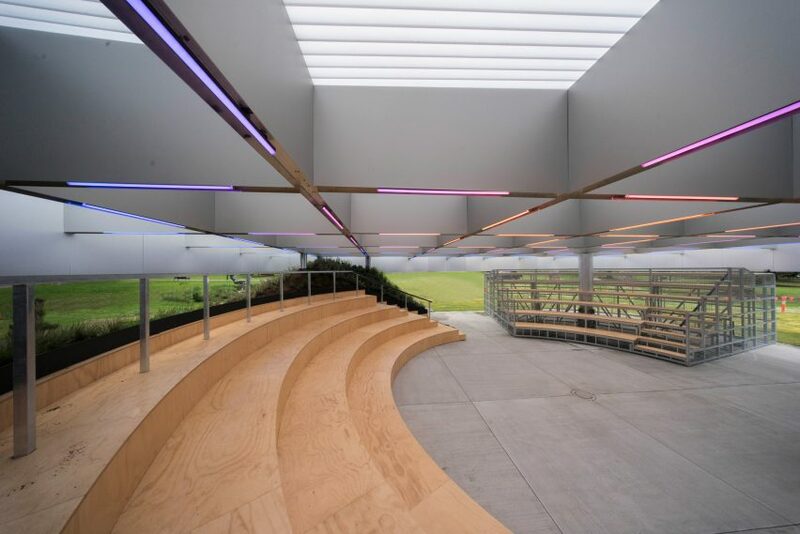 The pavilion includes one fixed and one moveable grandstand, to offer multiple configurations for the programme of activities the space will host over the Australian summer. A tw0-metre-thick roof extends from a mound of indigenous planting to shelter the seating and performance space within the 19-by-19-metre structure. “Our design for MPavilion 2017 is intended to provoke all kinds of activities through its configurable nature and a materiality that relates to its direct surroundings,” said Koolhaas and Gianotten, who first revealed their design in June. 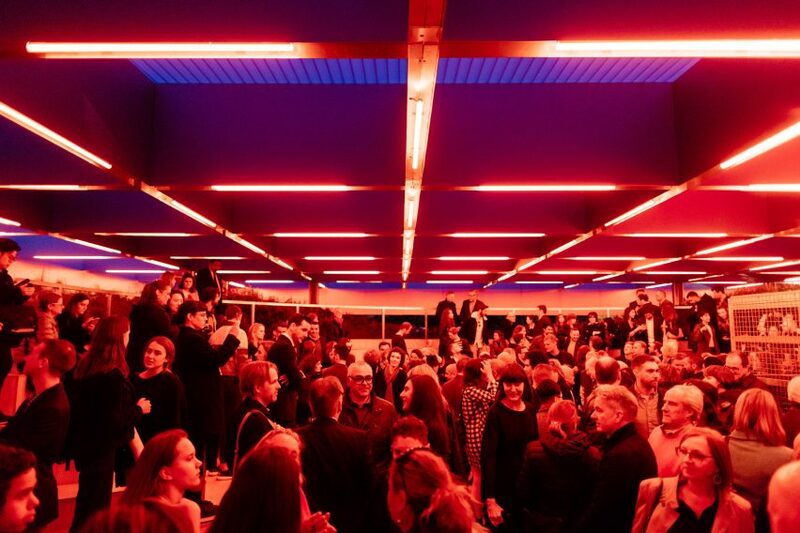 The gridded and translucent ceiling of the pavilion is enlivened at night by a network of coloured strip lights devised by Ben Cobham of Melbourne-based studio Bluebottle, and with music by Australian musician, composer and sound designer Philip Brophy. In the mornings, speakers in the pavilion will greet guests with stories recorded by N’arweet Carolyn Briggs, an elder of the Indigenous Australian Boonwurrung nation, and an expert in linguistics. 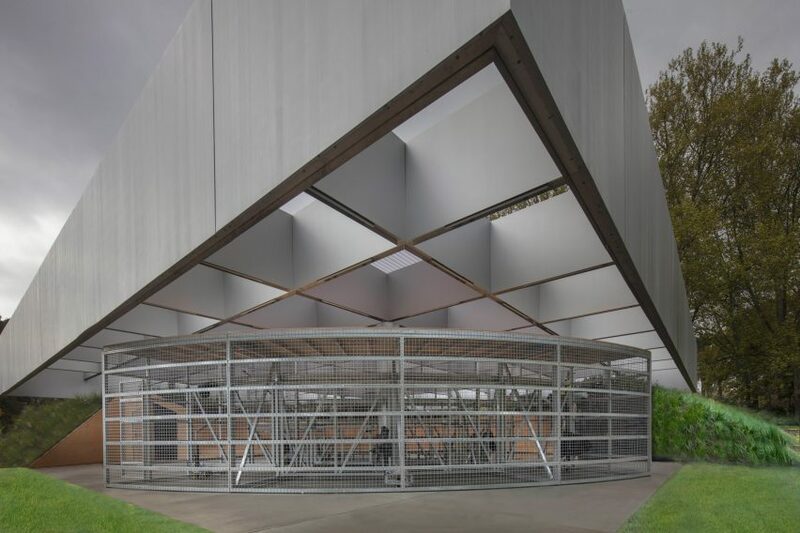 Seen as Australia’s answer to London’s Serpentine Pavilion, the MPavilion programme was set up by Australian philanthropist Naomi Milgrom in 2014. Migrom, who founded the Naomi Milgrom Foundation to support the pavilion, described the design as one of “profound vision and insight”. 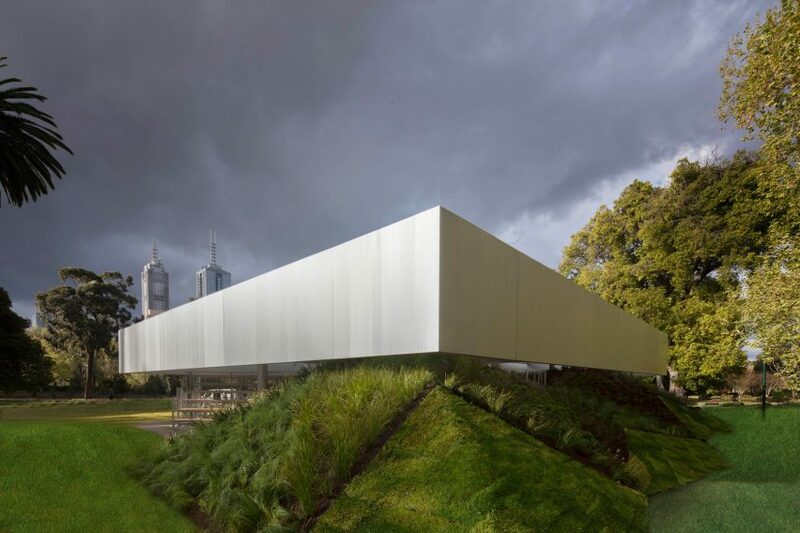 “It is a rare and privileged opportunity to have Rem Koolhaas and David Gianotten of OMA design MPavilion 2017, and a remarkable coup for MPavilion to be their first major commission in Australia,” she said. “For thousands of years, people have attended amphitheatres to escape reality and lose themselves in entertainment, while the audio and visual elements of MPavilion 2017 will be particularly engaging,” added Melbourne’s mayor Robert Doyle. The MPavilion will be open daily 9am to 4pm from 3 October until 4 February 2018, during which time it will be used as a hub for a programme of talks, workshops, performances and installations. At the end of its time in Queen Victoria Gardens, the pavilion will be moved to a permanent site in Melbourne’s central business district. 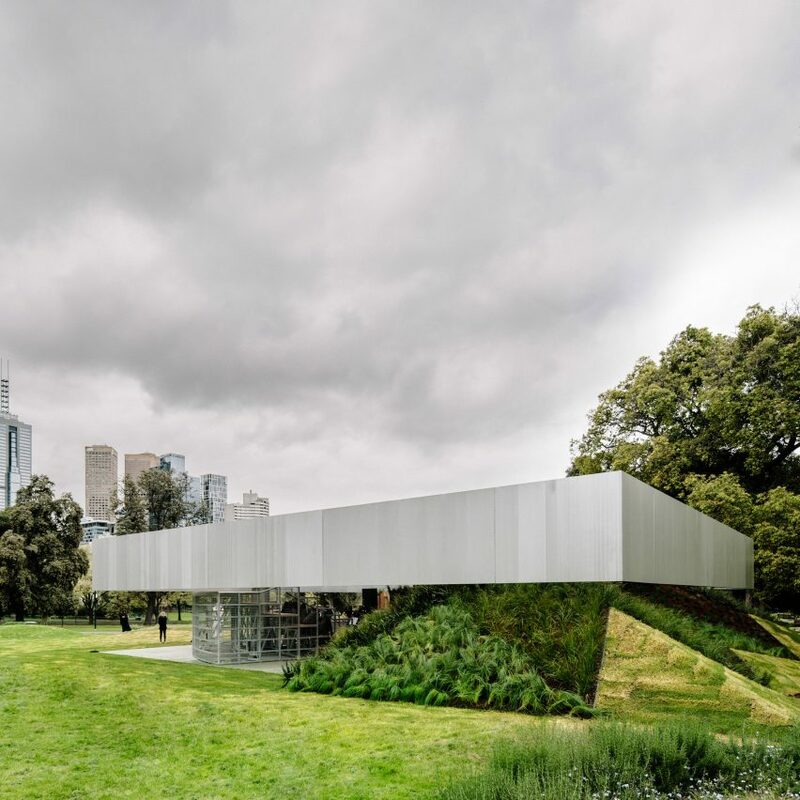 Last year’s MPavilion by Indian architect Bijoy Jain of Studio Mumbai is now located at Melbourne Zoo, while the 2015 pavilion designed by British architect Amanda Levete of AL_A has found a new home on Collins Street in the city’s docklands. 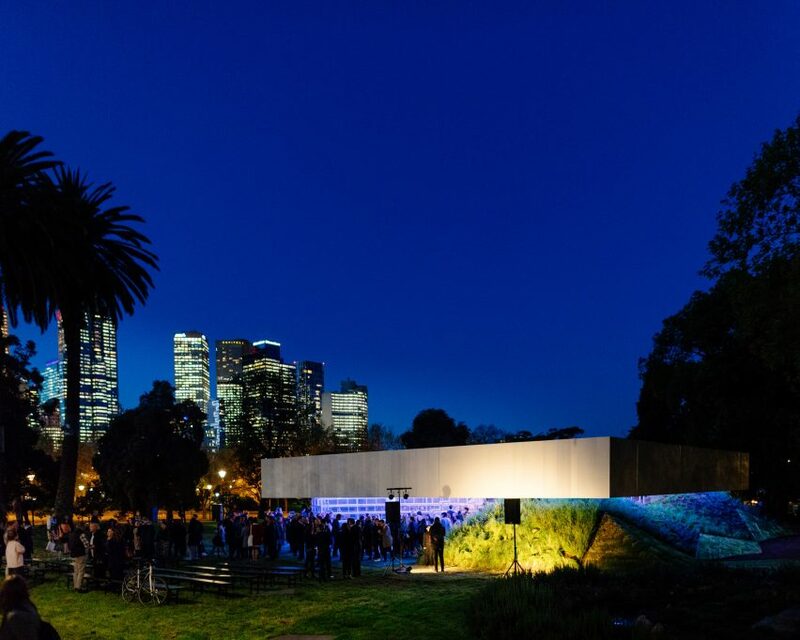 The inaugural 2014 MPavilion by Australian architect Sean Godsell was gifted to Melbourne’s Hellenic Museum. Rem Koolhaas and his Rotterdam-based practice OMA came in at number 12 on the first Dezeen Hot List, an annual guide to the most newsworthy architects, designers and institutions in the architecture and design world. The studio has just released visuals for a residential village it is building beside the Frank Gehry-designed Facebook campus in California, and recently completed work on a new laboratory building at an engineering school on the outskirts of Paris. Photography is by John Gollings, unless otherwise stated.